You can use SMS to promote your emails, and can use email to aware about your new Text Messaging channel. SMS Marketing can complement your email marketing by creating brand awareness, leads generation, and presenting as a new and ideal communication channel. Like you, your customers don’t have the time. If you own a business, a majority of the people walking through your door each day will do so with a Mobile phone in their pocket. - Apple iPhone is released in U.S.
Why SMS Should Be Added Into Marketing Trend?? One of the techniques that businesses both experienced and novice are tasting advantage of the recent growth in mobile activity is because of adding SMS into their marketing techniques. But SMS isn’t merely something being used amongst teenagers or college kids. Today, a majority of people are actively using SMS Marketing to remain in contact with their friends,relatives, and colleagues. These are the people who are mostly engaged in the content which they receive. Today, 90% of SMS are read within three minutes of delivery. Still have some confusions or doubts? Well what if I told you that SMS also fit thoroughly into the stuff you may be already using to do marketing in your small business? 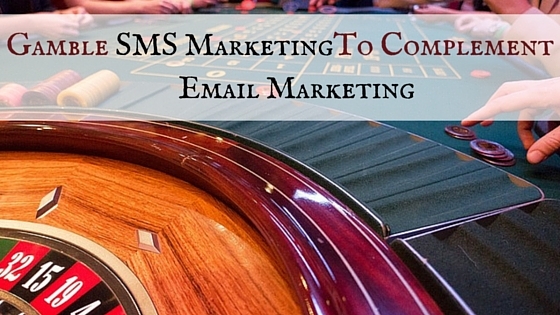 How To Grow Email Marketing Through SMS Marketing?? While SMS Marketing has many differences from email marketing, at the same time it also have some important similarities that make it the best complement to your email marketing techniques and even both the channels offers a two-way communication. You can use SMS for short, rapid and sensitive communications which means everything from saying thanks for being subscriber, appointment reminders to last minute sale message. And at the same time you can use can use email to send broad content and information to the place where your customers are going everyday : their inbox. With 43% of consumers now accessing emails via a mobile device, the mixture of SMS marketing and email marketing could be exactly what you need to adjust the needs of your growing mobile audience. Issue : It requires someone to write in all those email addresses by hand. How many email addresses would be lost due to bad handwriting? This method is not only faster and easier for the customer , it nearly avoids all risk of capturing an incorrect email address. Issue : The guy expects from listener to remember a complete website address and visit it in the near future. I mean seriously? This approach not only makes the audience to forget easily, even it doesn’t help the company to gain new sign-ups. Solution : If you’re interested in this product, signup for our newsletters and we’ll send you upto 80% off coupon for your first purchase. Text OFFEr to 12345 now.” The listener texts, provide their email address, and receives the coupon. Solution : “Thanks for coming today. We believe you enjoyed our facility. Be ready to win a $50 gift voucher, sign up for our email list by texting FREE to 12345.” The visitor texts in, with their email address and is instantly emailed a listing of the further month’s events.. If you are not sure that how your SMS Marketing can be a perfect fit for Email Marketing, then follow these 5 rules to make SMS Marketing the best complement to email marketing. You can mix up multiple texts together but it’s never advised. The grace of a 160 character limit is that it compels you to be to the point, saving your and your customers’ time. If you have a short story for your emails, then your marketing texts should carry a killer sentence. You can also provide your email link to let your customers read more regarding the offer, if your customer is curious to read the whole story then by clicking to the link it will take them to open their email and check the story. The easiest way to boost your bottom line and make customers happy through SMS marketing is to offer a deal like ‘show this text to avail happy hour to 9pm’ send at 6pm on a slow and silent evening. Short, valuable and concise texts can be sent more easily than emails, but as a decorum, you probably not supposed to be texting your customers more than 1 – 2 times per week. Hopefully, you can now judge value SMS Marketing could add to your existing email marketing efforts. But how can you quickly start it? If you’ve grabbed a good no. of phone numbers and have taken the permission from the customers to text them, getting ready to text those customers would takes even less than five minutes.